Chicken and rice may be any dish that primarily consists of these two ingredients. However, it usually refers specifically to a dish of baked chicken and rice topped with cream of mushroom soup. This particular chicken and rice dish is commonly served as a casserole. 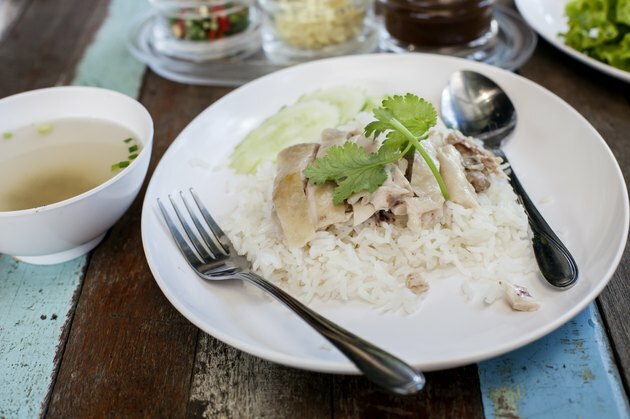 A typical chicken and rice dish consists of 4 chicken breasts, 1 cup of rice, a can of cream of mushroom soup, a cup of water and an envelope of onion soup mix. The chicken breasts are placed in a casserole dish, and the remaining ingredients are poured over the chicken. The chicken and rice is then baked in an oven. The nutritional information is based on a serving size of half the prepared dish. This will consist of about a half pound of chicken breasts, a half cup of rice and a half cup of cream of mushroom soup. A serving of chicken and rice contains a total of 577 calories. Carbohydrates provide 375 calories, proteins provide 78 calories and fat provides 124 calories. A serving of chicken and rice has 29 percent of the daily value (DV) for total calories based on a diet of 2,000 calories per day. A serving of chicken and rice contains about 95.7 grams of total carbohydrates, which consists of 92 g of pure carbohydrates and 3.69 g of digestible fiber. Each gram of pure carbohydrates contains 4 calories, so a serving of chicken and rice contains 92 x 4 = 368 calories from pure carbohydrates. Each gram of digestible fiber contains about 2 calories, so a serving of chicken and rice contains 3.69 x 2 = 7.38 calories from digestible fiber. A serving of chicken and rice contains a total of 13.8 grams of fat. Each gram of fat contains 9 calories, so a serving of chicken and rice contains 9 x 13.8 = 124.2 calories. Polyunsaturated fat accounts for 10 grams, and saturated fats make up about 3.8 grams. A serving of chicken and rice contains 19.5 grams of protein. Each gram of protein contains 4 calories, so a serving of chicken and rice contains 4 x 19.5 = 78 calories.